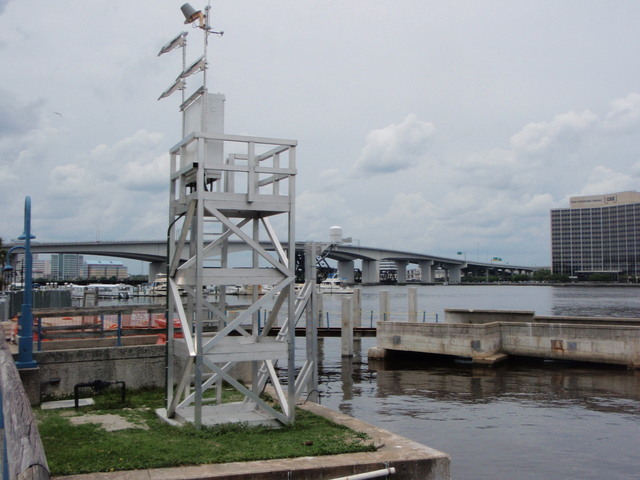 4:27 AM high 1.6 ft.
11:07 AM low 0.1 ft.
4:44 PM high 1.5 ft.
10:51 PM low 0.2 ft.
How to reach: To reach the tide station from the junction of Interstate 10 and Interstate 95, proceed east on Interstate 95 South over the Fuller Warren Bridge for approximately 2.3 km (1.4 mi) to exit 350B toward San Marco. Turn left onto Palm Ave and go north about 0.3 km (0.2 mi) to Prudential Drive. Turn right on Prudential Drive and travel east about 0.3 km (0.2 mi) to Main Street S. Turn left on Main Street S and go north about 0.3 km (0.2 mi) to Gulf Life Drive. Turn left on Gulf Life Drive and go west for about 45 m (150 ft) and turn right into the parking lot for the Museum of Science & History (MOSH). Proceed north for about 120 m (393 ft) to the north end of the parking lot. On foot, follow the sidewalk leading north from the parking lot for about 85 m (278 ft). The station is located on an elevated aluminum structure approximately 4 m (13 ft) north of the pedestrian ramp leading up to the Main Street Bridge and approximately 15 m (50 ft) west of the Main Street Bridge.